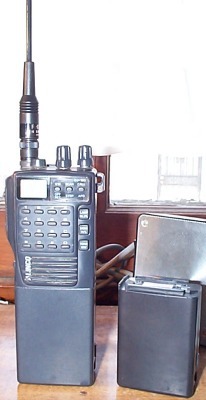 I have had three of these excellent radios, though not all worked at once. The original was a beaten unit that came off EBAY in 2000/2001. Only had 10 memory channels. Though it performed it's task well. Later I picked up two 200 channel units at a hamfest for a price that was steal, one working and one that sorta worked (low audio, buttons dead). I began using the working 200 channel often. Eventually the orignal suffered an LCD failure and the Ni-CAD batteries stopped charging and all three were shoved in the closet with all the accessories and batteries in mid 2003. Until 2006, when I spotted on ebay a new Ni-MH 2700mAH 7.2V battery. I took a chance and purchased it, and have never regretted it. 2700mAH on this radio results in a time between charges measured in DAYS! I have primarily used 5/8 telescopic antennas on these radios as the stock EA0024 ducks are the WORST thing ever. The extendables are nice and I have had 2 as they enevitably bend/break/etc... I recently switched to the rubber duck Diamond RH77CA antenna, Which i managed to drop and break at Dayton. I have a Generic long dual band whip now. The old solgier just keeps marching on. Recently I acquired a Ni-MH 12V 1000mAH battery which causes the radio to put out quite a bit more wattage, while still lasting quite long. As for the other two non working radios? I frankenstiened them together to get one working radio and sold it on Ebay. I still have a bag of parts for this radio. 100% Functional, Portable 160MHZ RR monitoring and Ham Radio use. Long generic dual band whip.